Dingoo Linux (Dingux) - News - Page 38 - PDRoms – Homebrew 4 you - Almost daily console and handheld news! Defendguin is a clone of the arcade game “Defender,” but with a Linux theme. Your mission is to defend little penguinoids from being captured and mutated. Rookie1 updated his menu system for Dingoo Linux which resembles the default Dingoo menu. James Fletcher brought his mushroom collecting game “Mushroom Roulette” to the Dingoo. Red Mushroom – Gives you 50 Score and 10 Health. Pink Mushroom – Gives you 150 Score takes 40 Health. Grey Mushroom – Makes all movable boxes unmovable. 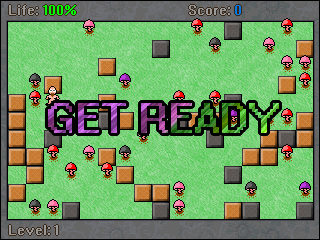 Purple Mushroom – Allows you to destroy one box. Butterfly – Takes sixth of your Score and a third of your health. notaz and A600 brought PicoDrive, a marvellous emulator for the Sega Megadrive/Genesis, to Dingoo Linux (Dingux). A new Dingux version has been released, which comes with a new rootfs. An EXT3 partition on the SD card is no longer needed. Actually EXT3 support has been dropped from the Dingux kernel in favor of FAT to make installing Dingux from Windows easier and reduce the kernel size. Due to other changes dynamically linked programs need to be recompiled for this Dingux version. Here is a new Gmu release which is compatible with the latest Dingux release. – Remove the mechanism to restart dmenu after the executed program has finished. This is not required anymore if you are using init to respawn dmenu. Here is another Gmu release for the Dingoo. Most notably it fixes an annoying bug where the backlight would not turn back on after a while when the hold mode had been enabled.